Foreword by Tania Aspland, Executive Dean of the Faculty of Education and Arts, and Professor in Teacher Education at the Australian Catholic University in Sydney. She is also President of the Australian Council of Deans of Education. She is currently engaged in a number of research projects focusing on higher education pedagogies in teacher education undergraduate and graduate courses, particularly in relation to professional standards and evidence-based assessment. AER 61 discusses the contemporary influences on initial teacher education, with particular attention to the notion of quality teaching, and the role of teacher education and teacher educators in the development of quality teachers. Section 1 introduces the key concept of ‘quality’ and explores the notion of quality in teaching. Section 2 reviews the context of education in Australia with discussion of the organisation and management of the educational systems, with particular attention to the different roles Federal and State/Territory governments play. Section 3 considers teaching as a profession by examining the nature of teachers’ work, working contexts and demands, and the variations or regularities that exist. The section reviews the characteristics of quality teachers versus those that are demonstrably competent. Section 4 discusses teacher education and the development of quality teachers and teaching with comment on program accreditation processes and the capacity for differentiating between basic teacher competence and quality. The role of the teacher educator is argued as being key to the development of truly quality teachers. Section 5 examines what it takes to be a quality teacher, what the personal attributes might be and how these extend from the competency framework for effective teaching. We challenge the notion that important personal quality attributes are appropriately accounted for in the current selection regimes for entry to teacher education and in the processes of accreditation. Additionally, the authors argue, it is the role of initial teacher education to target and develop these quality attributes. Bahr, N. & Mellor, S. (2016). 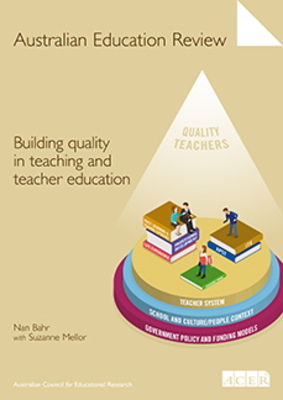 Building quality in teaching and teacher education. Australian Education Review No. 61. Australian Council for Educational Research, Melbourne, Vic.